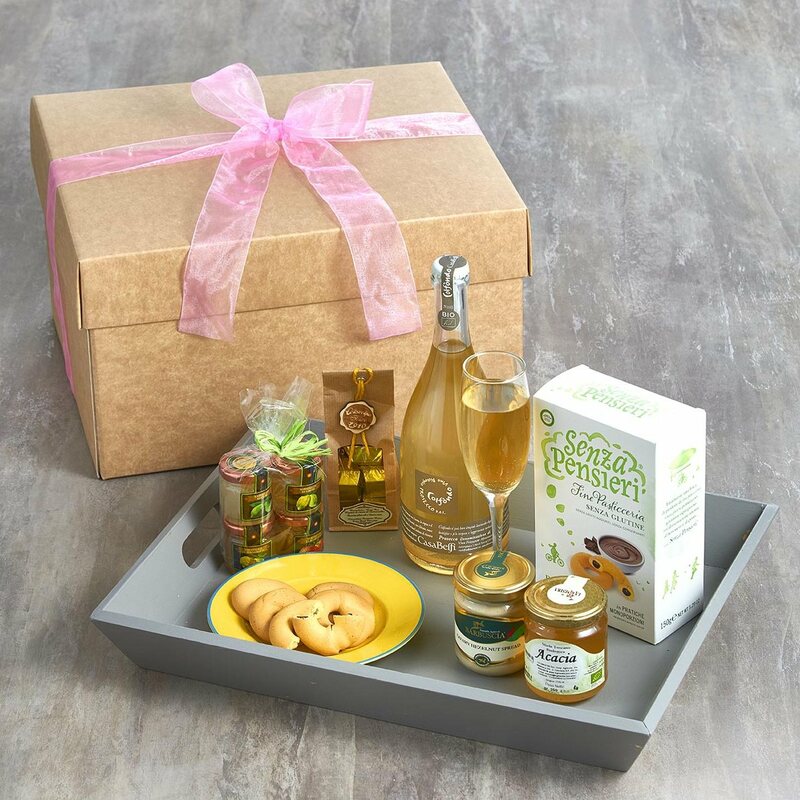 A gorgeous Italian breakfast hamper. Inside you’ll find ingredients to help you create an indulgent and very special breakfast in bed, including sweet Sicilian almond spread, organic Tuscan honey and of course a bottle of our very special organic Prosecco! Set of 4 Calabrian Citrus Marmalades (40g each) This cute set of 4 typically Calabrian citrus fruit marmalades includes bergamot, cedro (citron), mandarin and lemon flavours. They taste amazing spread on buttered toast, muffins or crumpets! Organic Chocolate Filled Biscuits (150g) These traditional Gluten Free Italian chocolate-filled biscuits originate from the beautiful island of Burano in the Venetian Lagoon. Delicious dipped in coffee! Sweet Sicilian Almond Spread (212g) Produced using Sicilian almonds, this creamy spread tastes incredible on bread, toast and pancakes. It has an amazing almond flavour and is very more-ish, especially when eaten straight from the jar on a spoon!! Organic Acacia Honey (250g) Acacia honey is very pale with a sweet, delicate floral flavour and therefore one of the most popular honey varieties. Organic Prosecco Colfondo DOC (750cl) Our organic, bio-dynamic, natural, vegan Prosecco DOC has been made in the Veneto region of Italy with traditional farming techniques, completely organic viticulture and very low intervention. Forget fungicides, pesticides, herbicides on the vines, this wine is pure, kind to the planet and very possibly better for your health! What's not to love?! All products are carefully wrapped and presented in a lovely strong box which is hand-tied with a pretty ribbon. A gift message option is available. Please note that if we are out of stock of any item in our breakfast hamper, we reserve the right to substitute it with the most similar available item. Hamper does not include tray, glass or dish. Allergens: almond, milk, butter, whey, soybeans, sulphites, sesame, eggs, gluten.